A rainy Saturday postponed the big race until Sunday June 25, 2017, but it was worth the wait and sun. 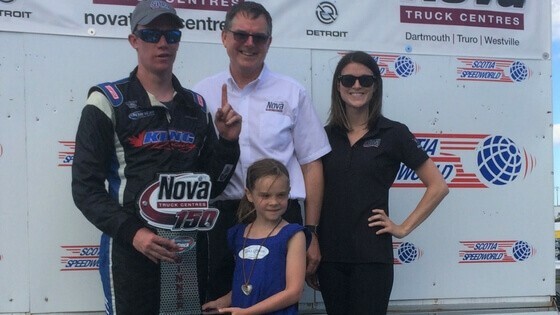 Cassius Clark (Farmington, ME) led the final six laps in a battle with Dylan Blenkhorn (Truro, NS) to take his first win of the Parts for Trucks Pro Stock Tour season in the Nova Truck Centres Make A Wish 150 at Scotia Speedworld. Clark started sixth in the 150-lap feature and took the lead from the first time on Lap 85 from Craig Slaunwhite (Terence Bay, NS) before he and Blenkhorn duked it out for the top spot in the waning laps. Blenkhorn and Slaunwhite joined Clark on the podium with Cole Butcher (Porter’s Lake, NS) and Dylan Gosbee (Cornwall, PE) completing the top five in the 22-car field. Atlantic Tiltload Qualifying started off the day’s racing action. Gosbee (Cornwall PE), Slaunwhite (Terence Bay, NS) and Shawn Turple (Enfield, NS) each took home heat race wins. Jarrett Butcher (Porter’s Lake, NS) finished in eighth to take home the King Freight Future Winner and Exide Batteries Rookie of the Race Awards. Slaunwhite led 80 laps of the Nova Truck Centres Make a Wish 150 to pocket the Linde Most Laps Led Award. Fans were treated to two of Scotia Speedworld’s CARSTAR Weekly Racing Series divisions prior to the Nova Truck Centres Make A Wish 150. Jorden Smith (Lakeside, NS) won the 25 lap Toursec Lightning feature, Deven Smith (Lakeside, NS) and Scott Thibodeau (Williamswood, NS) completed the podium. Matt Vaughan (Bedford, NS) took home the Pulse Heavy Duty Truck victory over Dan Smith (Lower Sackville, NS) and Megan Parrott (Beaver Bank, NS). Fans also had the chance to check out some of Nova’s big rigs during the Truck Parade just before the main event. Next up in the Maritime Pro Stock Tour line-up is the Cummins 150 at Speedway 600 in Fredericton, NB. See full 2017 race schedule. A big thank you to all the race fans who came out to cheer on drivers, customers who showcased their truck in our truck parade feature, Scotia Speedworld for hosting the race and of course Maritime Pro Stock Tour for making it all happen. Check out photos and videos from the event on our Facebook page.